Okay, that's actually his sock. Moving on, Steve is a man with sheds, and like any man with sheds he wishes to protect them. But rather than standing guard 24 hours a day with a handy flamthrower, he built a wireless alarm system. The system uses IR rangefinders to detect would be shed raiders, as pointed out by the man himself. 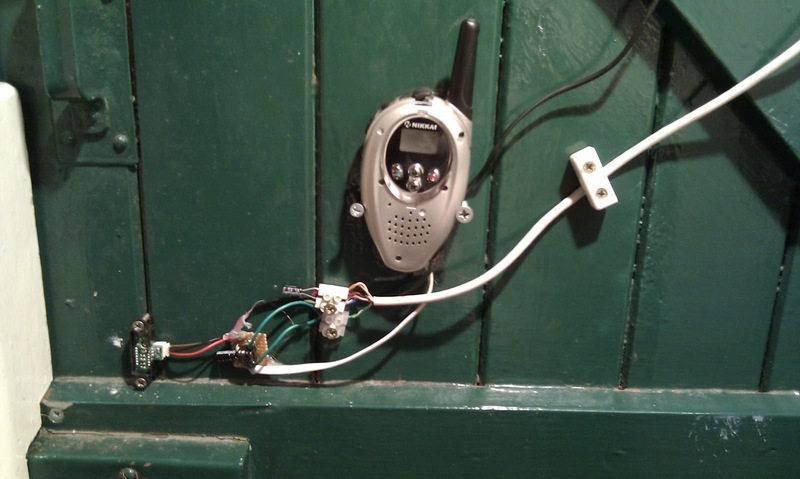 On the inside of the door there's the innards of the detector, a PIC12F675 and a PMR radio with added wires. The detectors (3 of, one per shed) have analogue outputs which the PIC reads and compares to it's stored values. If the reading on any input go over it's stored value for more that 10 readings, the PIC "presses" the call button on the radio, causing an annoying bleepy noise to come from the receiving bedside radio. This in turn causes an angry Steve to come running into the garden, chainsaw in hand. This is brilliant work. I've been thinking on a number of ideas over the past few months for my own shed, but this tops them all, and it should be easy to tie into my home burglar alarm system. Thanks for sharing. Love your sense of humor, too. I have dogs and a cat, so PIR sensors would get falsely triggered all the time. 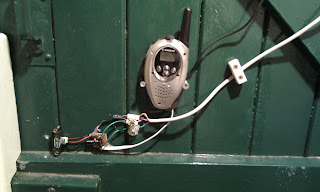 I was also keen to catch whoever has been nosing about trying to jemmy the doors, so this "silent" alarm would allow me to peer out the bathroom window to see the person. Automatically starting an 808 DVR recording is the next project... (Unfortunately they have a IR blocking filter built in, so I can't use IR LEDs to illuminate the s0d without him realising and get a nice close up of his face. Oh and walkie talkies are powered from old mobile phone chargers. Oddly the one I use indoors doesn't like 5V where there should be 3XAA batteries - it periodically beeps to warn of low battery! A diode in series with the power dropped 0.6V and now it is happy. The walkie talkies were kicking about and never used, the sensors were second hand and free, the phone chargers were from old phones that aren't used any more. The PIC looks at 3 analogue inputs - one going to each shed door (they are adjoining). 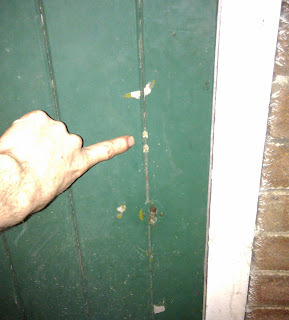 The cable used to go to the other 2 doors is the white cat5 you can see, again was laying around. There is a bent paperclip on the board for pulling down one more input - this looks at the current ADC values for each channel and saves them to EEPROM. On power up these are read, and a safety margin of 10 added, then these are used as the thresholds to decide if the alarm is triggered on each of the analogue inputs.